FK Lowry Piling have successfully completed a 7 week piling project for a new Client near Leeds. FK Lowry were subcontracted by locally based GMI Construction to deliver a £400,000 project to design and install up to 600 No. 600mm Diameter CFA Piles to depths up to 10m. 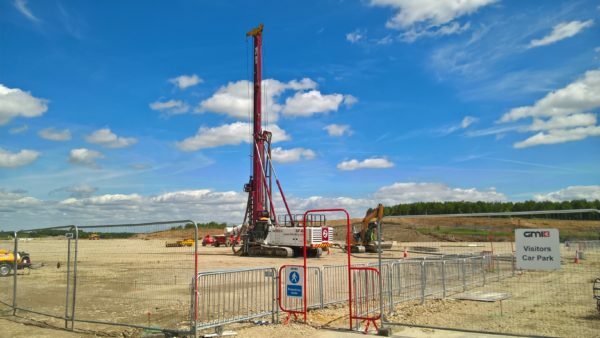 As well as designated CFA Piling Rigs, FK Lowry’s Fleet of Rigs are also able to offer “Dual Purpose” Rigs with “quick conversion capability” that can alternate between piling techniques/disciplines within a very short period of time. The overall scheme involves the construction of almost 300,000 sq ft of new retail space including retail outlets, restaurants, gym and a cinema. Ground conditions on the project consisted of typically Made Ground and firm Clays overlying interbedded bands of weathered Mudstone, Siltstone and Sandstone with occasional seams of very weak Coal.